With blade ejector for HEINE Disposable Tongue-BladesCan only be used with the mini 3000 handle system.Solid metal construction. Durable and tough.Finger-tip pressure releases the used blade. No need to touch the blade after use.Enhanced XHL Xenon Halogen Technology. Very bright white light. 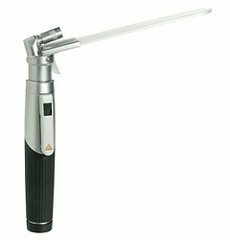 Concentrated illumination of oral cavity and pharynx.2-piece handle and head. Easy to maintain, flexible. Compatible with other mini 3000 instrument heads.High-quality handle: Chrome-finish upper section/refined plastic. Shockproof, sturdy, non-slip.Attachment clip with integrated on/off switch. Secure. Switches off automatically when replaced in the pocket. 20,000 switch cycles guaranteed.Only for HEINE Disposable Tongue-Blades. Strong and hygienic.